Next week, I’ll be in Jacksonville, as the lunch time keynote speaker for the annual meeting of the Materials Handling Association of America. We’ll have about 300 executives in the room, from a broad cross section of North American industry. My topic? “Moving Beyond the Meltdown: Aligning Yourself for Growth Through Innovation“. In the last twelve months, I’ve had a unique first hand opportunity to witness what’s happening on the ground throughout corporate North America as companies have grappled with the recession. Throughout this time, I’ve been fortunate enough to speak at a wide variety of leadership meetings, management get-togethers and other corporate events for a fascinating list of Fortune 500 organizations, as well as many prestigious national associations. And in my own small way, I’ve been busy helping people to understand what they need to do to innovate their way into the “next economy.” That’s because there are an increasing number of CEO’s or other members of senior management who are bringing me in, in order to help place emphasis on their message of the urgency of change. Clearly, the Detroit based old manufacturing business model was seriously and deeply flawed. The newer model, based on agility and flexibility is the model that will take may manufacturers into the future. There’s a similar fundamental transformation underway in many other industries — and to understand the link between future trends and innovation, you must get into that mindset. Take health care — 20 years from now, it will look nothing like it does today, as we move to a world of preventative medicine. It’s easy during a time of economic volatility to lose sight of where the global economy is really headed. Yet while stock markets might rock, innovation thrives. What’s my role? In each and every case, the individuals who have engaged me know that their industry and the world they live in is set for deep, systemic, transformational change. They have a compelling sense of urgency. They know that maybe the rest of their team does not share the sentiment; they’re suffering from organizational sclerosis; their ability to understand the future is clogged up by todays’ short term focus. Leaders today know that they need to wake their people up, shake them out of their complacency, and give them a clear understanding that they had better start thinking about the future — and fast — in order to keep up with high velocity change. And perhaps, if they are lucky, stay one step ahead of everyone else. Blog post: Are you watching the major transformations, or just the piddly stuff? Failing at the future: 10 reasons why some companies will miss out on the economic upturn! Just over a year ago, the global economy changed. What is that next economy? No one is certain, but what we can be sure of is that many industries will be fundamentally different; business models will continue to evolve at a faster pace; new revenue opportunities will continue to emerge; customer expectations will ramp up in terms of quality and service; we’ll see the ongoing emergence of new competitors; product life-cycles will continue to shorten as innovation speeds up; and a lot of transformative change will occur in markets and industries as really innovative people continue to shake up the fundamentals. So how are companies adapting to these realities? Since the events of last year, I’ve been out on the road working with dozens of organizations. I’ve seen and have worked with two different types of organizations and leaders. I’ve seen innovation failures — companies that are stuck in their economic rut, and unable to figure out what to do next. In other cases, I’ve encountered some real pioneers and fast-movers. They are the innovation leaders — they have the same sentiment that I posted in a blog a year ago, in that they know they can’t panic — they have to go forward by innovating, changing and adapting. Fear of the unknown: I still see many organizations who are driven by uncertainty. What happens if our market doesn’t recover? What happens if we can’t rebuild the top line? What happens if our customers don’t start spending again? So much fear and uncertainty causes a form of leadership and organization wide paralysis to set in; they’re like deer caught in a headlight, and are frozen in time. Avoid that fate – and fast! Inertia is easy: when confronted by change, many people react by …. doing nothing. When things are uncomfortable, the easiest thing to do to deal with that discomfort is to avoid it. Such thinking causes many organizations and the people within them to fall asleep. They keep doing what they’ve been doing before the recession, hoping that will carry them forward into our next, different economy. Obviously that can’t work, for a whole variety of different reasons. It’s easy to avoid tough decisions : organizations are faced with a lot of change, in terms of business models, customer expectations, cost pressures, new competitors, and countless other challenges. To deal with any one of these issues requires tough decisions, but in many cases, it’s easier to put those decisions off into the future rather than having to deal with them. An unwillingness to confront the truth: your product might be out of date; your brand might not been seen as relevant and keeping up to date with fast paced innovation in your marketplace; your sales force might be wildly out of date in terms of their product knowledge; your competitors might have a more efficient cost structure because they made the heavy IT investments that you did not. I could go on, but the point is this: you might have serious systemic problems, and are simply unable or unwilling to focus on fixing them. Have a reality check, and use that as a catalyst for action. A short term focus: you are still caught up in the economic-downturn hysteria headlines, and don’t think about business trends longer than three months. By doing so, you are missing out on the fascinating transformations occurring in many markets and industries, and don’t see the key drivers for future economic growth, with the result that you aren’t capitalizing on them. Innovative organizations have moved beyond the meltdown, and are already busy positioning themselves for the inevitable long term recovery. A culture that is risk adverse: so far, you’ve survived through cautious, careful manoeuvres. Yet the recession has left you naked with that strategy: going forward now requires trying to do a lot of things you haven’t done before. You’ve got a culture that doesn’t accept such thinking. Change that — now! Paralyzed by the fear of failure: related to your risk aversion is a culture that abhors mistakes. Anyone who errs is shunned; people whisper quietly about what went wrong, and what it might mean. Can that thinking: you should take your failures and put them up on a pedestal. It’s more important that you try things out, and learn about this new fast paced, post-recession world, since what worked for you in the past obviously won’t work for you in the future. Failure to adapt at fast markets : I’m dealing with companies that know that constant innovation with top line revenue — which means product and service innovation — is now all about time to market. You’ve got to have an innovation pipeline that is constantly inventing and reinventing the next revenue driver. What you sold in the past — you might not sell tomorrow. How are you going to fix that? By getting into the mindset of the high velocity economy. A refusal or unwillingness to adapt to new methodologies and ideas: in the manufacturing sector, it’s all about Manufacturing 2.0 or 3.0 or the next phase … in every industry, there is no shortage of new ideas, methodologies, processes, and fundamental change in terms of how to get things done. Maybe you’ve closed your mind off to new ideas, with the result that you fail to see how your competitors are rapidly shifting their structure, capabilities, time to market, product line, and other fundamentals. Wake up — we’re in the era of the global idea machine, and the result is that there is a tremendous amount of transformative thinking out there about how to do things differently. Tune in, turn on, and rethink! A loss of confidence: this economic downturn has had the effect of causing such widespread damage in various industries that some people and organizations and leaders have lost their faith in the future. They aren’t certain they can compete, adapt and change. Perhaps this is the biggest challenge of all to overcome — but you can only overcome it by getting out of your innovation rut and moving forward. It couldn’t have been put better. What’s your choice – to be an innovation leader, aware of where we are going in the future, or an innovation laggard, still mired in short term thinking? What’s next with economic development? My report from Missouri …. To compete – and win — in the 21st century, we must encourage entrepreneurship and small-business growth; enhance our workforce; and embrace emerging science and technology as critical industries of tomorrow. What Comes Next: And What Should We Do About It? Is there a future out there? Definitely yes, but a constant drumbeat of negative news can cause people to lose sight of what will happen as we return to a period of economic growth. That’s where Jim Carroll comes in — this noted international futurist, trends & innovation expert spends his time with globally innovative leaders. He’s gained keen insight into some of the key trends which will impact industries, organizations and careers in the next few years to come, in a wide variety of industries from health care, to technology and manufacturing, to the skilled trades. Jim is a passionate believer that we live in transformative times — and in five or ten years, will look back at this time with awe at the new industries, products, careers, and opportunities that were developed. Jim Carroll will challenge you to focus on the opportunities of today and tomorrow, rather than the challenges of the past. There have been quite a few economic development related talks as of late ; it’s my belief that with the downturn, a lot of people have lost sight of the transformational change that is occurring in many industries, particularly with leading edge innovation and future trends, and what local economic development officers might be doing to capitalize on those trends. What I’ve been doing is to help to bring a sense of optimism to those in the room. I’m thrilled that Microsoft has asked me to be the opening speaker for a number of events this fall, related to the Windows 7 launch. We will be talking to CIO’s, CFO’s and CTO’s for a wide variety of organizations from multiple different industries. This has been an area of heavy focus for me through the last year, as the economic downturn took hold. I’ve had the opportunity to watch and study what a wide variety of organizations have been doing to keep a growth orientation. There are many, many clients who are booking me because the CEO or senior management realizes they need to quickly re-align the thinking of their team towards growth; and through discussion with me, have discovered that I can play an extremely useful role in helping them accomplish this. Who’s working with me? I’ve had recent and upcoming engagements with General Dynamics / Northrop Grumman ; the 2009 Missouri Governor Economic Development Congress; Signature Travel global owners meeting; Microsoft; the US National Recreation and Parks Association; Yum! Brands; Burger King; US Department of Defence – Commissary Agency ; Rockwell Collins; Oracle ….. all of these organizations have engaged me for a keynote or leadership meeting focused on future trends, innovation and growth! Held in Washington, DC, it’s one of the world’s most prestigious health care events. Almost fifteen years ago, when I first got onto the speaking circuit, I registered the JimCarroll.com domain name. Often, that drew me many visitors looking for the “other” Jim Carroll. Sadly, that other Jim Carroll is no longer with us. Jim Carroll, poet, punk rocker, Pulitzer Prize winner, and best known as author of the Basketball Diaries, died of a heart attack in New York at the age of 60. When I was in my 20’s, I bought all his albums, and several of his books. I was a fan. I am sad to see him go. I did meet him in person once. 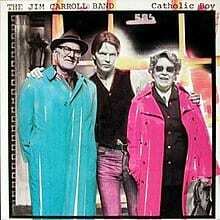 For more information on Jim Carroll, visit the CatholicBoy.Com Web site, which has been meticulously maintained by a fan through the years.